Recently, researchers at the Mayo Clinic created an online tool and an app for iOS and Android to help determine if you may have a recurring problem with kidney stones. The calculator makes predictions based on health history, race, age, and several other factors. The tool is based on the work of the researchers known as the Recurrence Of Kidney Stone (ROKS) model, which was developed in 2014. But the capabilities were expanded since then. ROKS was previously capable of determining the chance of a second stone occurring after an initial episode. And now it is able to predict the chances of the stones becoming a recurring issue. The research tool is based on data from the Rochester Epidemiology Project. A team of researchers used the data to explore a sampling of chronic kidney stone formers from Olmsted County between 1984 and 2017. “Each of the risk factors we identified are entered into the model, which then calculates an estimate of the risk of having another kidney stone in the next five or 10 years,” said one of the researchers, John Lieske, M.D. 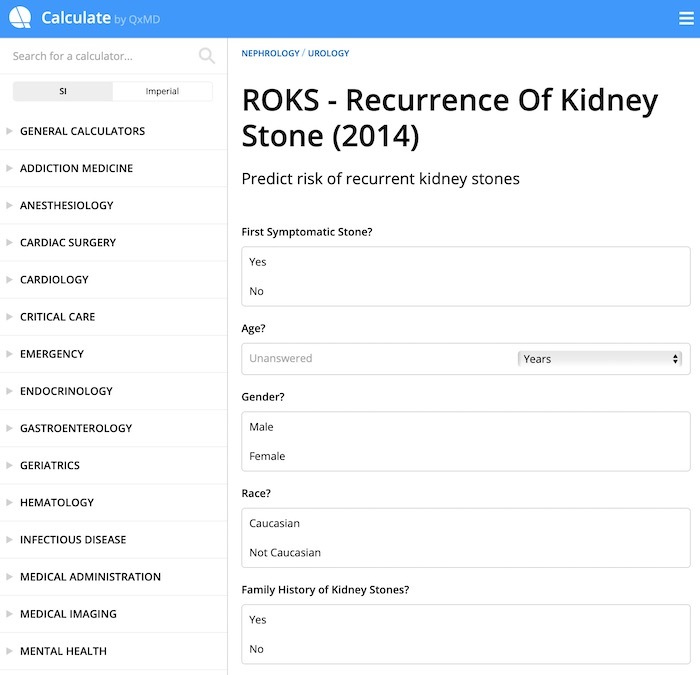 Updating the Recurrence of Kidney Stone model with data collected from the study improved the tool’s ability for predicting subsequent events. And since the risk of stone recurrence varies depending on individual factors, the information can be useful for patients or caregivers when deciding how aggressively they want to adopt measures to reduce the risk for stone recurrence.